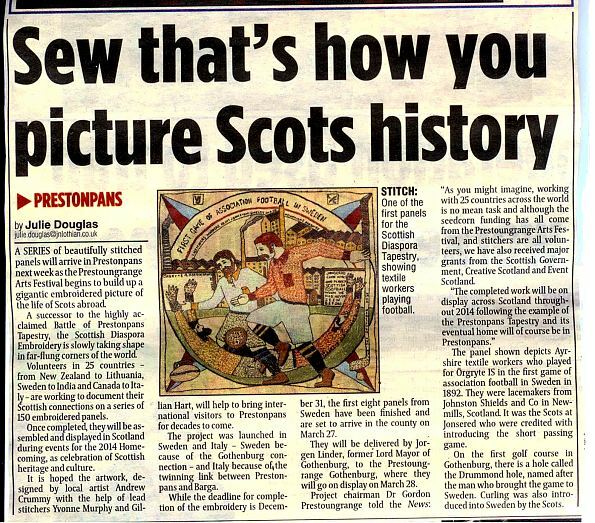 Fresh from the launch of the Homecoming programme with Visit Scotland, our team headed to the famous Prestoungrange Gothenburg in Prestonpans last week to welcome a much anticipated delegation from Gothenburg in Sweden! The Swedish stitchers, led by Lisbeth Cajstam, had been working hard to complete Tapestry panels for Easter! Now that their hard work was done, it was time to celebrate as the panels were unveiled in Scotland for the first time. The eight Swedish panels are the first of the estimated 150 which will emerge from our 25 chosen countries by the end of the year. 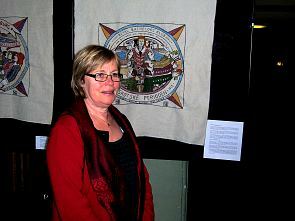 Seven have been completed in Sweden, with a further one being prepared by Christina Sundin here in Scotland. Now that the first international batch is complete, they should serve as inspiration for all those volunteers who are in the process of preparing to stitch their own community's story. 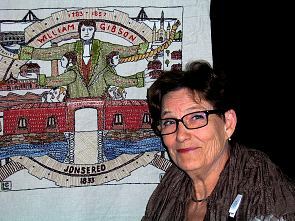 Meanwhile in Scotland, volunteers are now being recruited to stitch an additional panel that celebrates all the Gothenburg Pubs that opened in Scotland during the 20th century, not least those still active today such as the Dean Tavern at Newtongrange and the Gothenburgs in Armadale, Fallin and Prestonpans itself. 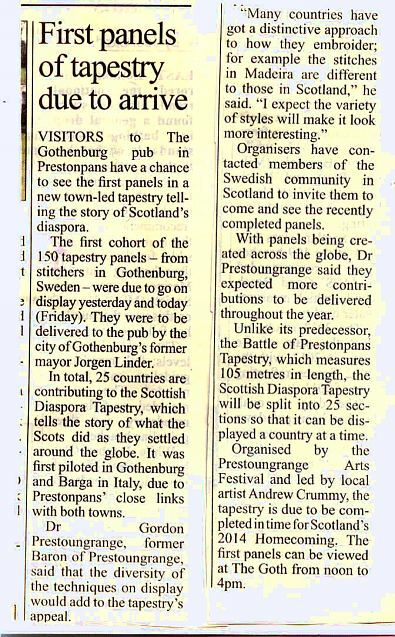 The Swedish panels were welcomed on behalf of East Lothian by the Provost Ludovic Broun-Lindsay, the Swedish Consul in Edinburgh, and members of the Scottish-Swedish Association. 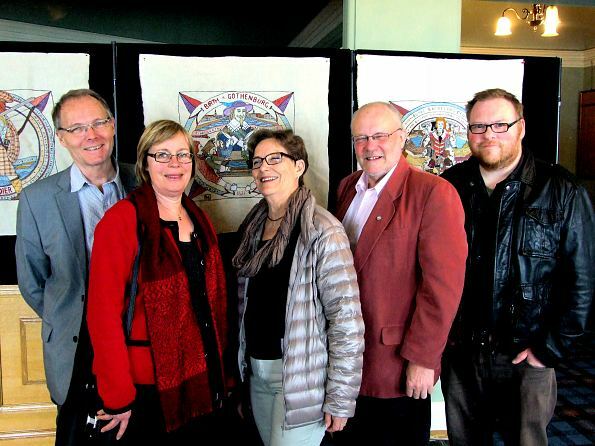 Receiving the panels were Andrew Crummy, the tapestry's designer, stitching leaders and co-ordinators Yvonne Murphy and Gillian Hart, webmaster and publisher Arran Johnston and Gordon Prestoungrange, Project Chairman. Tom Ewing of the Prestoungrange Arts Festival sang and made music in the bar all evening - he's a Gothenburg veteran from 2004 when he painted a commemorative artwork of Jorgen Linder's first visit that hangs in the Gothenburg Lord Mayor's Parlour. 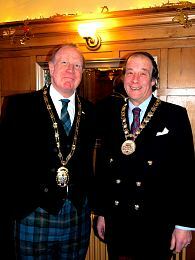 He met with the Lord Mayor at his two subsequent visits to Prestonpans in 2008 and 2011. There are even more clippings HERE!